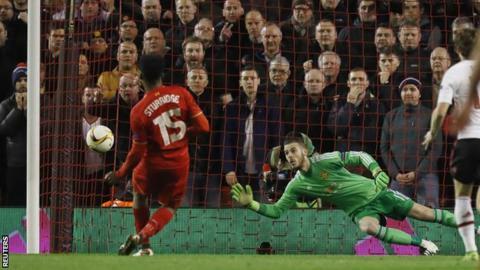 Liverpool took control of their Europa League last-16 tie as they swept aside a desperately poor Manchester United at Anfield. Jurgen Klopp's side dominated this first European meeting between the two Premier League giants in a thunderous atmosphere - and the German manager's only disappointment will be that the tie is not already settled. Daniel Sturridge gave Liverpool a 20th-minute lead from the spot after Memphis Depay fouled Nathaniel Clyne and Roberto Firmino added a second from close range with 17 minutes left. United did not create a single chance and only the brilliance of goalkeeper David de Gea has kept Liverpool in range as he produced a succession of magnificent saves. Liverpool have the destiny of this tie in their own hands now - and Manchester United fans might have been trying to offload their tickets for next week's second leg if it was not for the outstanding De Gea. The Spain international was world-class and it was only his constant interventions that kept Liverpool's lead anywhere near manageable for Louis van Gaal's side. De Gea saved superbly at the far post from Coutinho in the first half when many would have given up and showed brilliant athleticism to keep out the Brazilian in front of The Kop in the second half. He also blocked Sturridge when Chris Smalling missed a simple defensive header in Liverpool's opening surge and demonstrated his reflexes to stop Adam Lallana, as well as punching away Nathaniel Clyne's powerful drive after the break. In other words, the only reason United have any interest in that second game at Old Trafford is because of De Gea - and if they somehow pull this around it will be down to this virtuoso display. The fact two of the Premier League's superpowers had their first meeting on this stage in the Europa League is an indicator of the fact they have fallen out of the elite group contesting the Champions League. But was this a second-class atmosphere in a second-class competition? Not a chance. Anfield was crackling two hours before kick-off and The Kop's version of You'll Never Walk Alone evoked memories of Champions League semi-finals rather than this stage of Europe's second-tier tournament. The prize of a place in next season's Champions League for the Europa League winners is a massive incentive - but so was the old rivalry between two clubs who argue over their respective European pedigrees. Liverpool's fans revelled in the manner in which they over-ran the old enemy and red smoke from a flare swirled around a cacophonous Anfield after Firmino scored their second. It may not be the competition these two clubs want to be in - but as Liverpool fans celebrated at the final whistle that complaint will have fallen on deaf ears. United's fans will need to create a similar environment next week if they are to have any chance of reaching the last eight. This was an opportunity for United to show there is some life left in Van Gaal's regime - but they were a tactical shambles and off the pace all over the pitch, De Gea apart. Anthony Martial got no service worthy of the name and sympathy goes to teenager Marcus Rashford, dumped in an unfamiliar position on the right flank and removed at half-time when Van Gaal introduced Michael Carrick and went to three at the back. And the symbol of all United's struggles was the hopeless figure of Marouane Fellaini, taunted for his Everton connections and fortunate to stay on the pitch after being a consistent offender all night, even ending the game by appearing to lay out Emre Can in an aerial challenge. United were dismal - the only consolation being that despite this harrowing night, they still have a semblance of a chance in the second leg. In contrast, Jurgen Klopp's Liverpool showed signs of becoming exactly what he wants them to be at Anfield. The Reds simply pressurised United into submission, much to the delight of the manager who was an advocate of the high-intensity "Gegenpressing" system with former club Borussia Dortmund. They gave United no time on the ball, constantly robbing them in possession and forcing mistakes by being simply too quick and too mobile for Van Gaal's side. Manchester United have not won any of their past six away games in the knockout stages of European competition, losing five. United have kept just one clean sheet in their past 10 trips to Anfield in all competitions. Daniel Sturridge has scored five goals and assisted one in his past seven games against United in all competitions. United faced eight shots on target against Liverpool, the joint-most they have had to defend in a single game this season. Roberto Firmino has scored in three consecutive games for Liverpool for the first time. Liverpool's next match is the second leg at Old Trafford on Thursday, 17 March, while Manchester United host West Ham in the FA Cup quarter-finals on Sunday. Match ends, Liverpool 2, Manchester United 0. Second Half ends, Liverpool 2, Manchester United 0. Hand ball by Divock Origi (Liverpool). Corner, Liverpool. Conceded by Michael Carrick. Attempt blocked. Nathaniel Clyne (Liverpool) right footed shot from the centre of the box is blocked. Attempt missed. Marouane Fellaini (Manchester United) header from the centre of the box is close, but misses to the left. Assisted by Bastian Schweinsteiger with a cross. Offside, Liverpool. Dejan Lovren tries a through ball, but Philippe Coutinho is caught offside. Attempt missed. Jordan Henderson (Liverpool) right footed shot from more than 35 yards misses to the right from a direct free kick. Substitution, Manchester United. Bastian Schweinsteiger replaces Morgan Schneiderlin. Goal! Liverpool 2, Manchester United 0. Roberto Firmino (Liverpool) left footed shot from the centre of the box to the top right corner. Assisted by Adam Lallana. Corner, Liverpool. Conceded by Marcos Rojo. Dangerous play by Marcos Rojo (Manchester United). Offside, Manchester United. Daley Blind tries a through ball, but Memphis Depay is caught offside. Attempt missed. Jordan Henderson (Liverpool) right footed shot from the centre of the box is high and wide to the right. Assisted by Adam Lallana. Attempt saved. Nathaniel Clyne (Liverpool) right footed shot from outside the box is saved in the centre of the goal. Assisted by Emre Can. Substitution, Liverpool. Joe Allen replaces Daniel Sturridge.